It’s been a long time since I’ve watched Edward Scissorhands all the way through. I used to start to watch it and then get lost in one of the beginning scenes when Peg Boggs (Dianne Wiest) finds Edward (Johnny Depp) hiding in his castle. I had to revisit it from start to finish tonight as one of my favorite films and one featured in 1,001 Movies You Must See Before You Die. “Edward Scissorhands isn’t perfect. “It’s something better: pure magic,” Peter Travers (Rolling Stone, 1990) as quoted in the book. I think part of the reason I like the beginning of the film so much is because it does fit into that idea of magic and happiness with how the community welcomes Edward into their fictional cookie-cutter world as the backdrop. Edward, at first, brings a welcome chaos to the community’s organized life and the Boggs take him in without judgment or as much misdirected attention to his “disability” as their neighbors do. The Boggs remain loyal to Edward and try to help him make a life for himself, but when some people take advantage of his goodwill and not knowing right from wrong the community eventually turns on Edward. He doesn’t want to hurt anybody but is out of his element after living a sheltered life in a castle where his inventor (Vincent Price in his last film role) died before he could finish his hands. The real magical, as well as heartbreaking, moments in the film are when Kim (Peg and Bill Boggs’ (Alan Arkin) daughter played by Winona Ryder) and Edward grow close and begin to understand each other but know they cannot stay together. It is hard to get to that point in what starts out as a happy fairy tale, but Tim Burton’s use of reality within a fable is effective and makes the story complete. Besides, “You can’t buy the necessities in life with cookies.” – Bill Boggs. I have to say: 4 out of 4 stars. I was going to wait until a week and seven movies in, but I am too excited about my project to watch, and write about, 365 movies this year that I had to post this blog for it to be official. My goal is in part inspired by one of my favorite comedians, Doug Benson, who set out to watch 365 movies in 2015. I know he made it to at least 360 films before the end of the year. I also received the latest edition of 1,001 Movies You Must See Before You Die for Christmas and immediately started making a list and I am marking the pages with Post-It notes all the time. The book is also inspiration for my project and using this time to watch classic films and those I studied in college. I know my list could change throughout the year as new films are released in the theater and I think of new titles I want to watch or watch again. The unknowns of where this project could lead make it even more exciting. At the very least, I know I will have fun with it and have an excuse to watch even more movies this year. I saw Mustang on New Year’s Day with just a few people in the theater and later that day worked a shift when a couple showings of Carol almost sold out. Nearly 300 people came to Carol for one show, while there were 50 people in one day to see Mustang. As of the time I am writing this I haven’t seen Carol (and they’re really not comparable stories,) but it’s a shame more people didn’t take the opportunity to see Mustang in the theater. I thought the film was wonderful as a coming-of-age story about five sisters in a rural village in Turkey and their family’s plan to keep them at home away from society until they are ready to be married. This happens after the sisters are “caught” playing a game at the beach with some boys after school and ratted out by a neighbor who thinks they were behaving inappropriately. Their grandmother and uncle’s restrictions become worse as the story goes on and the girls break the rules by sneaking out or even just talking back to their family. One by one the girls are married as Lale, the youngest, watches her sisters leave. They are with husbands they don’t want to marry with the exception of Sonay, who is allowed to be with her boyfriend. The film delves into their culture and more misbehavior by the elders in the family than the girls commit. While there are dark moments in the film, the focus on the five sisters and their relationship and time they spend together at home when they’re not learning to cook or sew is moving and lightens things up a bit. At its core the story focuses on Lale and her efforts to not have the same fate as her siblings. I recommend Mustang as a glimpse into a culture you may not know about as well as at the countryside of Turkey and the performances by the young actresses as five sisters bonded by tragedy, love, drive and hope. Mustang is director and co-writer (with Alice Winocour) Deniz Gamze Ergüven’s first feature film and as of this post is nominated for a Golden Globe as Best Foreign Film. Ergüven won an award for Best First Feature for Director and co-writer (with Alice Winocour) at the Philadelphia Film Festival. It also has nominations and one award from the Cannes Film Festival. 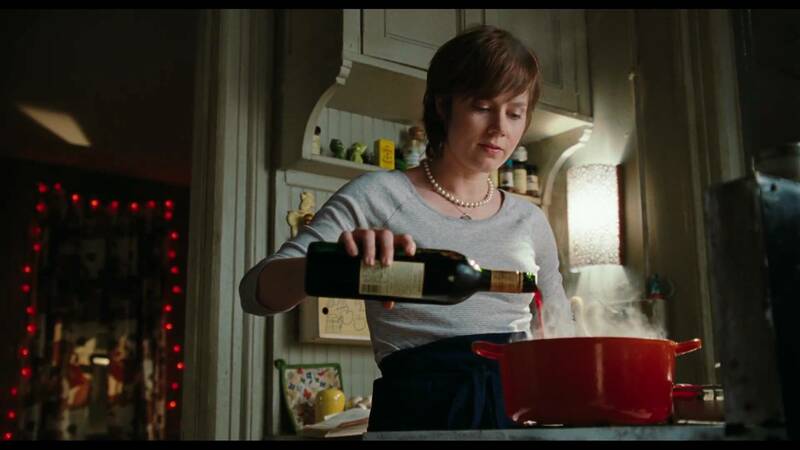 I thought this film by Nora Ephron was fitting to watch in the first week of my project as it’s about a woman who decides to cook all of the recipes in Julia Child’s first cookbook in one year and write a blog about it. I am not going to insert myself into this movie so much that I believe I need to do this project or it’s “all I have,” but I am inspired by Powell’s (played by Amy Adams) purpose in having a goal to meet every day and a journal of it to look back on. For me, this next year of blogging and watching movies will also serve as a journal as I am sure I will reflect on moments connected to the movies I watch and what I take away from those experiences. Back to Julie & Julia, the film has its weaknesses in its predictability and scenes that fit the stereotypical portrayal of a young woman struggling against her own self, seemingly more successful friends, judgmental mother and fights with her cute husband etc., but those moments are few and far between and balanced with the telling of Julia Child’s story as she writes and develops recipes for her first cookbook. Adams and Meryl Streep, who plays Julia Child, balance each other well even though they never have a scene together. Overall, the film is entertaining and a unique telling of two separate, but connected stories and I enjoyed watching it again. I needed a shorter film to watch this morning before work and thought it would be a good time to see one of the horror films on my list. The Babadook uses just the right pace to build how a monster coming to life from a child’s story book haunts a single mother, Amelia, and her son Samuel between his sixth and seventh birthdays. Samuel’s father died on the day he was born, thus already creating haunting memories of that day for him and his mother. In some ways The Babadook adopts the traditional formula of a horror film as lights flicker and things go bump in the night, but the real scares come from how the monster inhabits Samuel and Amelia at different times and the visions they see. In the beginning, Samuel is seemingly the evil one and seeing things but when Amelia is affected by the monster and tries to get help, no one will believe her. The Babadook writer and director Jennifer Kent effectively weaves a scary tale with real human emotion and struggle and ends the film in a realistic way. The monster is not gone, but Amelia and Samuel found a way to live with it. The ending felt a little bit anti-climatic in that way but it works in The Babadook and it was refreshing to see a horror film that evolved into a unique presentation of the genre in 90 minutes. Stars: 3 out of 4.